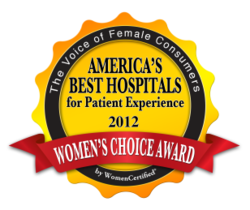 WomenCertified®, the collective voice of the female consumer, announces its 2012 list of America’s Best Hospitals for Patient Experience -- recipients of its Women’s Choice Award. The selection identifies the country’s best healthcare institutions based on robust criteria that consider female patient satisfaction and what women say they want from a hospital including quality physician communications, responsiveness of nurses and support staff, cleanliness and trusted referrals from other women. WomenCertified is a trusted referral source for top businesses and brands identified as meeting the needs and preference of women. Hospitals qualify for the highly selective annual list of America’s Best Hospitals for Patient Experience based on an in-depth proprietary scoring process. The scoring incorporates a national, standardized survey of patients' perspectives of hospital care reported by the U.S. Department of Health and Human Services (Hospital Consumer Assessment of Healthcare Providers and Systems) and an analysis that weighs criteria identified as the most important to women for patient satisfaction. Additionally, the scoring incorporates WomenCertified’s in-depth research on customer satisfaction among women, including a joint study on customer satisfaction by gender conducted with the Wharton School of the University of Pennsylvania. The America’s Best Hospitals for Patient Experience by WomenCertified consists of four categories, with a total of 400 hospitals recognized nationwide. They include hospitals with up to 100 beds, 101-250 beds, 251-400 beds and 401-plus beds. The 100 best scores in each category determines the Award winners. View the complete list online. WomenCertified accepts absolutely no payment in exchange for placement on the list.